Enable Download Service Select the check-box to enable the download service. The current state of the service is displayed as “Service is stopped” or “Service is running”. Max hard upload rate The maximum upload rate you can tolerate on your link in kB/s (0 = no limit). The limit applies to all your connections (clients and servers) and both control and data messages. 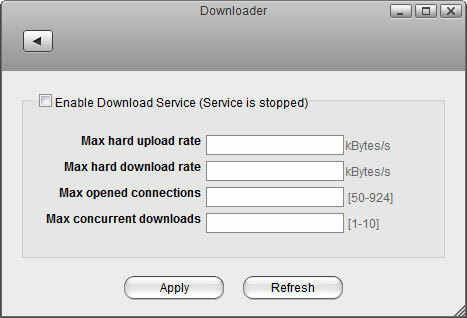 Max hard download rate The maximum download rate you can tolerate on your link in kB/s (0 = no limit). The limit applies to all your connections (clients and servers) and both control and data messages. Max opened connections Maximum number of open connections. Max concurrent downloads The maximum number of files that are currently downloading (others will be queued). Apply Click Apply to save the changes. For instructions about how to use the Downloader, see Applications > Downloader. Before enabling the download service, make sure that you have a hard drive setup and mounted as “HOME”. Otherwise, the system will not have enough room to store the temporary files during the download.